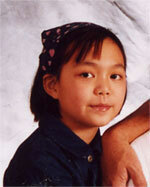 Karine Ng Wai, one of the children that Herbie Fund has helped. Without a surgeon on the island of Mauritius that could assist Karine, her future might have been very bleak. But fortunately, a Canadian relative contacted the International Patient Program and applied for help from Herbie Fund. After reviewing her medical information, the acting head of cardiology recommended Karine to be one of the fortunate patients who would have her care covered by Herbie Fund. Upon learning the good news, Karine's father was overcome with gratitude: "It is such a great fund," he said. "The world should know about it." Karine travelled to Toronto in April 2002, accompanied by both her parents. SickKids' Dr. John Coles was Karine's surgeon and the outcome of her surgery was excellent. Karine's physician in Mauritius, Dr. Philip Li Loong, wrote to HSC to advise that she and her family had returned home safely. In addition, he stated, "my sincere thanks to you and your team of Herbie Fund and to Dr. Coles and his team. You have changed Karine's life". Karine is alive and well today because of an international program that believes a child's suffering is shared by the world and The Hospital for Sick Children, Herbie Fund was here to help.